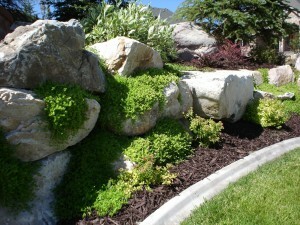 Most landscapes in Utah – especially mountainous Draper and Park City – need a specialized landscape wall or custom rock wall. 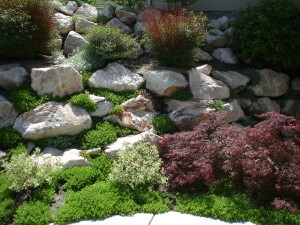 Pebble Creek Landscaping can help you design it and then build it for you. Whether you need a custom retaining wall for that pesky slope, a rock wall for accent, a more purposeful block wall, a decorative sitting wall, hardscapes, a custom rock wall, large slab stairs, or a designer Belegard wall, let us build it for you. We specialize in building large engineered walls to help you level useless slopes into purposeful areas. Don’t let that steep slope deter you from your dream sports court, play area, fire pit, kitchen or grilling patio, additional parking area, a spacious RV parking pad, or even a pool – complete with waterslide down slope! Or do you prefer a beautiful deck? We can build your custom natural wood or composite deck off of your beautiful retaining wall – helping you maximize more of your sloped space into usable area. No matter your natural landscape, we have options to help you make it a usable and prime space. Building a custom rock wall will not only give you more usable space, but also help you save your hard-earned money. How? Less water will be slipping down that pesky slope and away from your carefully chosen plants. No matter what wall needs you have, Pebble Creek Landscaping can help you design it and then build it for you. We’ll even help it look great at night with landscape lighting. Let us help you create your custom dream landscape today. Contact us for a FREE landscape wall design consultation with one of our trained specialists.